There are profiles of two very good runners who represented Falkirk Victoria Harriers on the track, on the road and over the country already covered on the website – namely Jim Dingwall and Willie Day. But it is self evident that any club needs more than one or two stars to make up a team – especially a six-man team plus reserves or an eight-man squad as was needed for the Edinburgh to Glasgow Relay. When the two men already mentioned were the top men the club was blessed with a fast pack of top-quality runners, several of whom were unlucky to be running at a time when the sport in Scotland was fortunate enough to have a host of excellent athletes. Peter Faulds, in the picture above by Graham MacIndoe, who took all the photographs on the page, was just one of them. Colin Youngson has written about these men who were known and respected across the country in the 1970’s and 1980’s. Falkirk Victoria Harriers finished eighteenth in the 1974 Edinburgh to Glasgow Road Relay. One year after, they were seventh. How to explain the difference? Jim Dingwall! He had been working at Grangemouth and living in Falkirk but still running for Edinburgh AC. However he was sick of coming second in the E-G and when thirteenth place in the 1975 National Cross-Country made him only seventh man home and a non-counter due to EAC’s illustrious winning team, he decided to switch to FVH and join his training mate Willie Day (a Junior Cross-Country International back in 1967 in a quest to overcome the big city monopoly. One previous Falkirk star had been Sam Downie, who won the Senior East District title in 1972. As is mentioned in his Marathon Stars profile (click on the link above) Jim was charismatic and thoughtful as well as a brilliant runner and his arrival led to increased success for his new club. In both 1976 and 1977 Jim, Willie, John McGarva and Ian Brown won bronze medals in the Scottish Cross-Country Relay. This quartet won another bronze in the 1976 Edinburgh to Glasgow with the assistance of Mike Logue, Willie Sharp, R Adam and B Morton. Their next success was in 1979: another relay bronze with Davie Lothian replacing Ian Brown. In the Six-Stage Road Relay it was bronze in 1980, silver in 1982 and, much later, bronze in 1993. The Senior National brought bronze in 1984 and silver in 1985. However, Falkirk’s greatest days were in the E-G: two glorious wins in 1984 and 1990, plus third place in 1985 and second in 1992 and 1993. In 1984, Donald Bain gave his club an excellent start with second place on Stage One. Gordon Mitchell, Ian Johnston and John McGarva fought hard but slipped back a little, before Derek Easton moved up to fourth with the second fastest time on Stage Five and the inimitable JD raced into first position on Stage Six (also with the second fastest time behind Nat Muir). John Pentecost and Stuart Easton extended the lead to a comfortable 96 seconds in front of Cambuslang. Falkirk Victoria celebrated (Jim, Willie and John were dedicated real ale fans) and there could not have been more popular winners. In 1990, only Johnston and Pentecost remained of the 1984 gold medallists, but both starred in a most dramatic race. Robert Cameron finished the first leg in eighth place before the talented John Sherban zoomed into the lead with the fastest time on Stage Two. Peter Faulds kept in front and Ian Johnston moved further away with the fastest time on Stage Four. 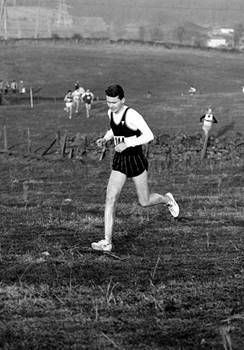 However, holders Dundee Hawkhill Harriers and Caledon Park Harriers moved closer on Five, although Donald Bain kept the lead. Gary Grindlay was second equal at the end of the long Stage Six, before Mike McQuaid finished Seven only four seconds behind Dundee. Former infant terrible John Pentecost kept a very mature head and battled right to the end against Richie Barrie. They were the two fastest men on Stage Eight but John managed tosqueeze home by four seconds! Now for some very brief sketches of notable Falkirk runners, Jim Dingwall and Willie Day have already been profiled. John McGarva was a talented extrovert who trained hard despite being rather injury-prone. He ran the steeplechase in 9:13.8 but his speciality was cross-country (tenth in the 1979 Senior National). In the four National team competitions, John won four bronze, two silver and one gold. He was a great team man who went on to create a micro-brewery (trystbrewery.co.uk) which is still very successful, especially in the production of bottle-conditioned beers with a fantastic range of flavours. Thoroughly recommended! Ian Brown won the East District Junior Cross-Country Championship twice, in 1977 and 1978. he also ran the World Junior Cross-Country twice and was first Scot home (seventeenth) in Glasgow 1978. After winning three bronze medals with FBVH during an inconsistent career, he eventually joined Racing Club Edinburgh and was in two winning E-G teams in 1992 and 1993. Mike Logue was a tough guy to train with and ran a 2:27 marathon. One of his finest runs was on the hilly Stage Three in the 1976 E-G, when he kept the lead and was only twelve seconds slower than the great Lachie Stewart. His team won bronze; and he obtained another similar medal in the 1980 Six-Stager. Mike, who had previously run the E-G with Victoria Park AAC was a confident fashionable fellow who also smoked small cigars! Dave Lothian, who became a successful coach, was cheerful and sociable. 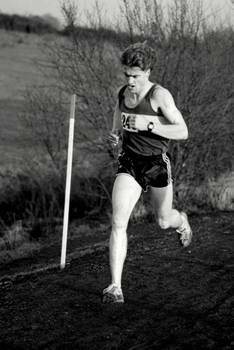 He won a Scottish Schoolboys 800m title and bronze medals in the Six-Stage Relay and teh Cross-Country Relay. Ian Johnston ran well in the E-G, winning gold medals in 1984 and 1990, plus silver in 1993 when he was only five seconds off fastest on Stage Four. Stuart Easton was a Scottish track international who specialised in the 1500m. He won a Scottish title indoors and two bronze medals outdoors, with a pb of 3:45.8. Eventually he produced a 2:23 marathon. He ensured FVH’s first major triumph by running strongly on the last leg of the 1984 E-G. Nowadays he is a very fast veteran cyclist and triathlon competitor. Derek Easton, Stuart’s younger brother, represented Falkirk Victoria more frequently. He won two Scottish 2000m steeplechase titles in the Scottish Schoolboys Championships. As a senior he ran the steeplechase in 9:11.7 and a marathon in 2:26. In 1984 on Stage Four of the E-G he moved up three places and provided the momentum to win gold. In addition, he won bronze in the 1985 E-G and silver in the 1982 Six-Stager. In recent years, Derek has been a very successful coach. Gordon Mitchell was a very talented young runner, who was part of Falkirk’s winning team in the 1979 Scottish Cross-Country Relay Championship for Young Athletes. He was fourth in the 1980 National Youths Cross-Country and second in 1981. Then he was second once more in the 1982 National Junior after which he represented Scotland in the World Junior Championships. His best Senior National placing was twelfth in 1985. On the track he ran 3000m in 8:20.07 and 5000m in 14:18.37. For FVH in the E-G, he won gold in 1984 and bronze in 1985, as well as silver in the 1982 Six-Stager, bronze in the 1984 National and silver in 1985. Gary Grindlay was in the Falkirk team that finished third in the 1985 E-G. After running for Edinburgh Southern Harriers for a while (winning silver in 1988) he returned to FVH in 1989 and was fastest on Stage Eight. He helped to win gold in 1990 and another silver in 1992, when he was second fastest on Four. Another silver was obtained in 1993 and Gary led the way by winning Stage One. He also won a bronze in the 1993 Six-Stager. Peter Faulds was a very useful, tough runner, who showed talent as a Youth. In the Senior ranks, he won E-G bronze in 1985 (finishing third on Stage One) and gold in 1990 (second fastest on Stage Three). He was fastest on Stage Three when his club ended up fourth in 1991. In addition he won silver in the 1982 Six-Stager and two team medals in the National Cross-Country – bronze in 1984 and silver in 1985. He finished an excellent seventh individual in the 1990 National. Donald Bain was fastest on Stage Seven in the 1983 E-G. He was twenty second (and first finisher from Falkirk Victoria) in the 1984 National Cross-Country when his team won bronze medals. Donald was third counter in the Vics outfit that won silver in the 1985 National. He won E-G gold, in 1990 when he was second fastest on Stage One. 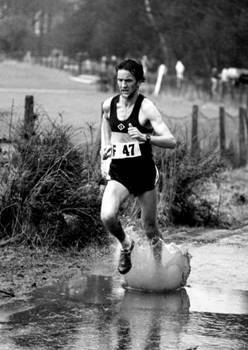 Another silver was gained in the 1992 E-G.
John Pentecost was in the Falkirk team that won a bronze medal in the 1984 National Cross-Country. That summer he ran a fast steeplechase in 9:06.5 and then won team gold in the E-G when he was second fastest and extended the lead on Stage Seven. John was in the team that finished second in the 1985 National Cross-Country. In 1990 he was fastest on Stage Eight of the E-G when his finishing sprint won gold medals for his team. John Sherban, an English International runner, was controversial but undeniably talented. He was fastest on Stage Two when FVH won the 1990 E-G, fastest on Stage Six when silver was gained in 1992, featured in the team that finished second in 1993 and was fastest on Stage Three in 1994. On the track he won the Scottish 5000m title (representing England) in 1991, recorded a very rapid 13:46.4 in 1994, was somehow selected for the Scottish Commonwealth Games team for Victoria but was injured and did not start in the 5000m or finish in the 10000m. Mike McQuaid . ran eleven consecutive Edinburgh to Glasgow Relays for FVH between 1990 and 2000. He won team gold in 1990, silver in 1992 and silver in 1993. In addition he gained a bronze medal in the 1993 Six-Stager. Mike has gone on to be a successful veteran athlete on road and country and in 2011 represented Scotland in the annual British and Irish Masters Cross-Country International. Other Falkirk medal winners included: Willie Sharp (a consistently good club standard runner, 51 minute 10 miler), Jim Evans (SAAA Medallist, 8:57 3000 steeplechaser), Rab Cameron (Scottish Schools, Scottish U20 internationalist), Kenny Rankin (14:19 for 5000m), Steve Binns (English internationalist), Frank Harper (SAAA medallist, 2:18 marathon), Gordon Crawford (International steeplechaser), D McMillan. W Grieve, A Murray and R Jones. Following on from Colin’s record of Falkirk Victoria Harriers achievements it could be noted just how many of their runners mentioned above became coaches in the club. Willie Day took up coaching and worked with some very good field events athletes of both genders, Willie Sharp was a steeplechase coach who became Scottish National coach for the event and also coached runners such as Ian Johnston, Derek Easton was and is a very successful coach of endurance runners coaching such as Morag McLarty and Alistair Hay to Scottish championships and Games selections, Dave Lothian was not only a coach but also a senior figure in Scottish Schools Athletic Association and they were not the only ones who served their club in that capacity. When he was at college in Glasgow Davie Lothian ran for Shettleston Harriers in the Track League as indeed did Stuart Easton and, for a shorter period, Derek Easton. As Colin says, their victory in the Edinburgh to Glasgow was very popular. 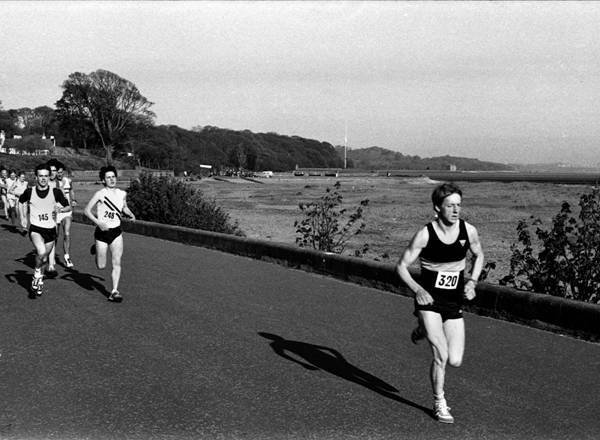 Their runners were seen all over Scotland in the same events as everyone else – Willie Day and Willie Sharp for instance ran in all the major road races – the Gourock 14, the Clydebank to Helensburgh 16, the Strathallan 20 and so on; others like Ian Johnston and Rab Cameron were members of the British Milers Club and performed at a consistently high level and they were all fairly gregarious characters. A good club, a popular club and one that thoroughly deserved its successes.